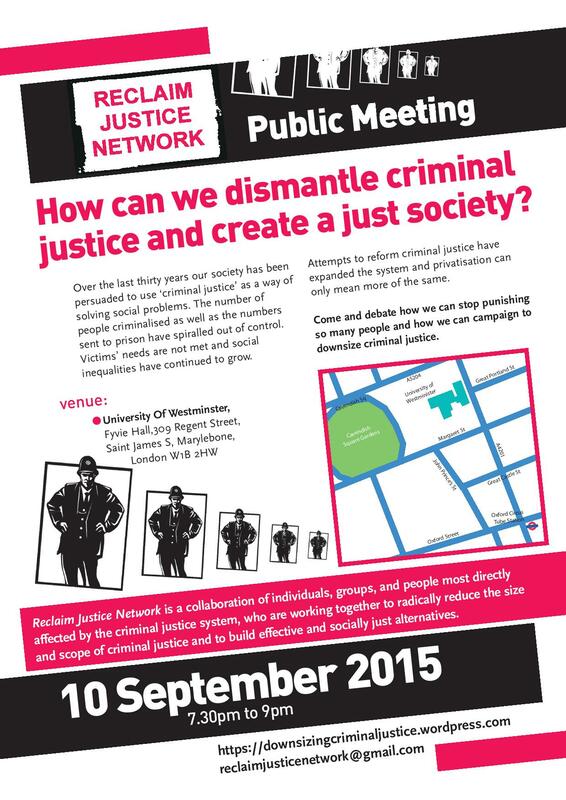 Public Meeting: How can we dismantle criminal justice and create a just society? Over the last thirty years our society has been persuaded to use ‘criminal justice’ as a way of solving social problems. The number of people criminalised as well as the numbers sent to prison have spiralled out of control. Victims’ needs are not met and social inequalities have continued to grow. Attempts to reform criminal justice have expanded the system and privatisation can only mean more of the same. Come and debate how we can stop punishing so many people and how we can campaign to downsize criminal justice. This entry was posted in Events and Meetings. Bookmark the permalink.